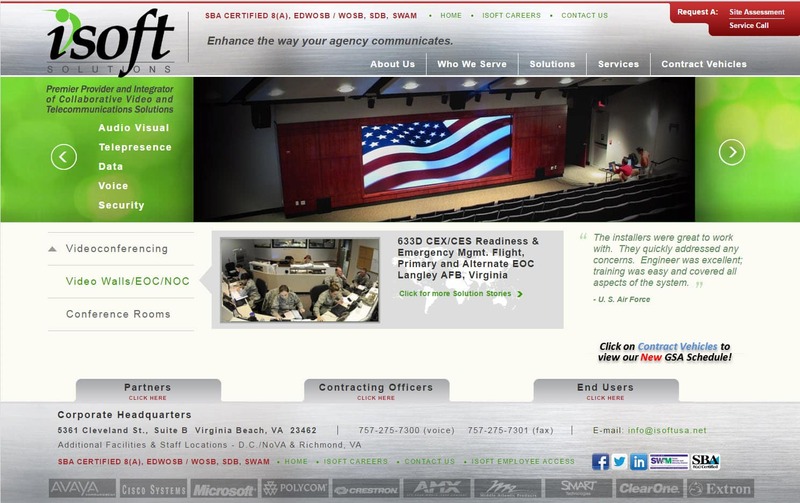 Website design for GSA business eSeaport consultants | iSoft is a IT solutions integrator based in Virginia Beach, VA. The website is open source PHP and advanced jQuery scripting. The website was originally a classic ASP site then converted to PHP during a recent redesign. This is the 2nd redesign for iSoft since becoming a VISIONEFX client many years ago and continues to generate online customer leads and support the existing customers. VISIONFX has worked with GSA contract holders and e-Seaport throughout Virginia. Does your current business website look dated or you need a brand new website? We craft professional, mobile responsive custom web design for your company or consulting business.